Chippendale Waye is one of the streets of London in the UB8 postal area. Uxbridge, a Middlesex market town, lies at the end of the Metropolitan and Piccadilly lines. The name is derived from "Wuxen Bridge" which was likely to have been near the bottom of Oxford Road where the "Swan and Bottle" now stands. The Wuxen were a seventh-century Saxon tribe. The town centre today comprises large retail outlets and major office buildings, including the main European offices of several international companies. 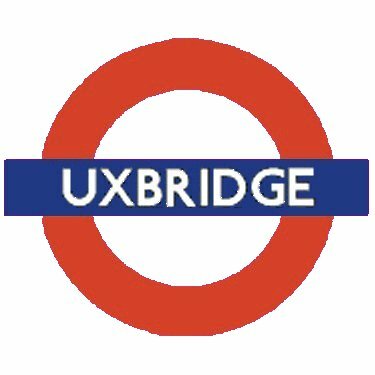 Uxbridge is also the home of Brunel University and the civic centre of the London Borough of Hillingdon. The civic centre is an award-winning building designed at the peak of the 1980s trend towards a new, postmodernist architectural style. Adjoining the town is RAF Uxbridge, where many Royal Air Force personnel are based. It was from here that much of the Battle of Britain was controlled by 11 Group. Archaeologists found Bronze age remains (before 700 BC) and medieval remains when the new shopping mall The Chimes was being built. 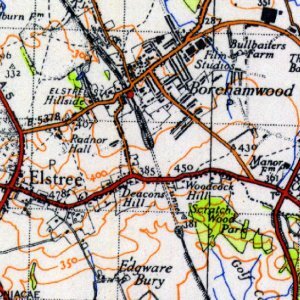 Two miles away at Denham Upper Paleolithic remains have been found. Uxbridge is not mentioned in the Domesday Book of the 11th century, but a hundred years later the existing church, St Margaret’s, was built. The existing pub, "The Queens Head", has a sign depicting Anne Boleyn, wife of Henry VIII. The pub was previously called "The Axe" and possibly dates from the 1540’s. A tunnel connects the pub to the church. At the bottom of Windsor Street there is a cemetery with an archway. It was here on Lynch Green that three heretics were burned to death in 1555. Foxe’s Book of Martyrs gives the names as John Denley, Robert Smith and Patrick Packingham, but other sources call the last one Patrick Rockingham. He was found guilty of denying the trinity. Under Elizabeth I, Roman Catholics were subject to severe constraints. Edmund Campion was a Catholic priest, trained in Douai, to give covert support to Catholics. He travelled around England on horseback, giving sermons in secret and pretending to be a diamond merchant. In 1580 he came to Uxbridge and hid for a couple of weeks, in a house owned by William Catesby. In 1581 Campion was caught. He was hanged, drawn and quartered in London. The 40 or so Catholics who died in this period are called the "Douai martyrs" which is also the name of the local Catholic secondary school, in Ickenham. In 1605 the Gunpowder Plot was uncovered. The flamboyant six-foot leader, Robert Catesby (son of William), escaped and hid in his house in Uxbridge. He was later shot. There were negotiations between Charles I and the Parliamentary side in Uxbridge, January 30 to February 22 1645, commemorated in the name of a local pub and restaurant, the Crown and Treaty. This latter is on the A4020 Oxford Road where it leaves the town, at the canal overbridge. The covered market was built in 1788, but the previous building was about twice as big, creating big problems for traffic. The former Grand Junction Canal now Grand Union Canal, which connects London with Birmingham, passes immediately to the west of Uxbridge, and forms the borough boundary. 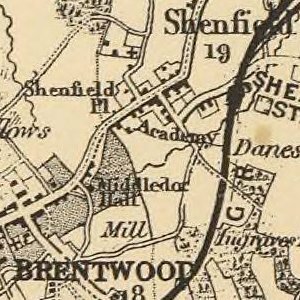 The first stretch was built in the late eighteenth century from Brentford to Uxbridge. Further upsteam is Uxbridge Lock, and nearby is a flour mill belonging to Allied Mills. This was bought in the nineteenth century by a Mister King, who called it "Kingsmill". This brand name is still one of the best-selling bread-makers in the UK. In the early 19th century, Uxbridge had an unsavoury reputation. The jurist William Arabin said of it residents "They will steal the very teeth out of your mouth as you walk through the streets. I know it from experience." In the 1930s George Orwell was a teacher at Frays College, now Frays Adult Education Centre. His novel A Clergyman’s Daughter was based on his experiences there. For about 200 years most of London’s flour was produced in the Uxbridge area. There were also breweries, but the last one was closed down in the 1930s. Near here Ellen Terry the Shakespearean actress spent her final years, as a pub landlady. There were once three railway stations - Uxbridge Vine Street (originally just Uxbridge Station), Uxbridge High Street, and Uxbridge Belmont Road. All three have now closed. The line formerly to Belmont Road now terminates at the present station, Uxbridge, fronting the pedestrianised High Street, and is served by the Metropolitan and Piccadilly lines from Rayners Lane.